Aston Villa ended a tumultuous week with a valuable point as they edged closer to Premier League survival after a goalless draw with Southampton. The club suspended assistant boss Ian Culverhouse and head of football operations Gary Karsa on Tuesday with the club struggling for form. Southampton dominated proceedings with Steve Davis having their best chance but Brad Guzan kept out his effort. Villa are now five points above the bottom three with four games left. It has been a difficult week for the club off the pitch following the suspensions of Culverhouse and Karsa pending an internal investigation. 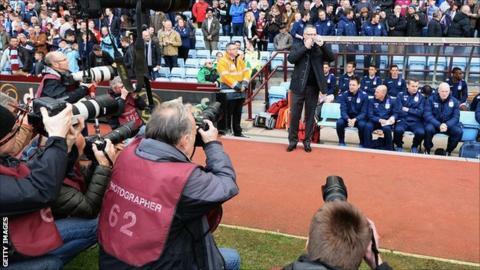 Villa's boss Paul Lambert was assisted by Gordon Cowans and Shay Given for the visit of Southampton and the result, which ended a run of four consecutive defeats, will provide some relief for the beleaguered manager. His players seemed to be feeling the pressure of their perilous position in the table and were off the pace in a disappointing first-half performance. They failed to muster a single shot on or off target with Southampton enjoying 71% of possession during the opening 45 minutes. "It doesn't matter how they do it, they just need to survive and at last for Villa after the events of this week there is something to smile about." Saints dominated the first half with Rickie Lambert heading straight at Guzan from Luke Shaw's cross while later seeing a side-footed effort deflected wide. Davis had Southampton's best chance of the half but his strike on the turn from 12 yards after poor Villa defending was superbly kept out by Guzan on the stretch. Villa's fans had little to get excited about other than Ryan Bertrand's cross, which was beaten away by Artur Boruc and then rebounded off Dejan Lovren for a corner. A chance eventually fell Villa's way and it came from a poor clearance by Boruc that eventually fell to Karim El Ahmadi - but after he showed neat footwork to create an opportunity, his tame shot from the edge of the area was comfortably held. Southampton should have been in front but Adam Lallana skewed his shot wide from six yards after a fine surging run and cross by the impressive Shaw on the left wing. At the other end, Marc Albrighton tested Boruc with a rasping drive from 20 yards with the Polish keeper having to gather at the second attempt. Saints tried to claim a penalty late on after Bertrand blocked Nathaniel Clyne's cross in the box but Lee Mason waved away their appeals as a poor game ended scoreless. Aston Villa manager Paul Lambert: "To play the way we did in the second half, against a good Southampton side, I cannot fault the effort. "The lads deserve enormous credit and with their energy and desire I couldn't be prouder. Our goal difference is pretty good, so we'll probably need one more win [to be safe from relegation]. "After the events of this week, that performance shows evidence of the players' commitment." Southampton manager Mauricio Pochettino: "I thought we did enough to win the game but we are lacking luck and clinical edge in front of goal. "We started off well, had 70% possession but are not taking chances. We are creating them and look like a team fighting to win the Premier League so I am happy with the effort. "I saw the handball and I thought it was quite clear, replays also show it was clear but the linesman was close and he didn't even see it." Match ends, Aston Villa 0, Southampton 0. Second Half ends, Aston Villa 0, Southampton 0. Substitution, Southampton. Harrison Reed replaces Adam Lallana. Offside, Aston Villa. Marc Albrighton tries a through ball, but Callum Robinson is caught offside. Attempt missed. Callum Robinson (Aston Villa) right footed shot from the right side of the box misses to the left. Assisted by Brad Guzan. Foul by Dejan Lovren (Southampton). Substitution, Aston Villa. Callum Robinson replaces Andreas Weimann. Substitution, Southampton. Jack Cork replaces Victor Wanyama. Offside, Aston Villa. Marc Albrighton tries a through ball, but Grant Holt is caught offside. Offside, Aston Villa. Gabriel Agbonlahor tries a through ball, but Marc Albrighton is caught offside. Substitution, Aston Villa. Grant Holt replaces Karim El Ahmadi. Attempt missed. Andreas Weimann (Aston Villa) right footed shot from outside the box misses to the right. Assisted by Ryan Bertrand. Corner, Southampton. Conceded by Ron Vlaar. Substitution, Southampton. Sam Gallagher replaces James Ward-Prowse. Luke Shaw (Southampton) is shown the yellow card for a bad foul. Foul by Luke Shaw (Southampton). Offside, Southampton. Morgan Schneiderlin tries a through ball, but Adam Lallana is caught offside. Attempt missed. Ashley Westwood (Aston Villa) right footed shot from outside the box misses to the right. Assisted by Gabriel Agbonlahor. Attempt saved. Marc Albrighton (Aston Villa) left footed shot from outside the box is saved in the top left corner. Fabian Delph (Aston Villa) wins a free kick in the attacking half. Dejan Lovren (Southampton) is shown the yellow card for a bad foul. Offside, Aston Villa. Ryan Bertrand tries a through ball, but Gabriel Agbonlahor is caught offside. Luke Shaw (Southampton) wins a free kick on the left wing.